Barbie Pink Leather One inch wide Strap that incorporates a one inch roller buckle fasten and keeper. Comes with three Large Shield/Teat pacifier sections with 12mm wide matching Pink UV Neon PVC straps with press stud fastens to attach them to the one inch welded rings at the end of the main leather straps. 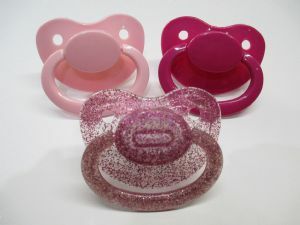 The Three Pacifier colours are Light Pink, Hot Pink and Glitter Pink, and as our pacifier design comes apart for cleaning or mixing and matching, then these three colours can be mixed and matched to create a possible twenty seven colour combinations! The very popular demand for our unique AB/DL design of pacigags, has prompted us to create an interchangeable front design which is a brand new product to add to our growing range of AB/DL Collection. With an extra Large shield and teat Pacifier which can be taken apart for hygiene purposes (Note only the pacifier shied is fixed to the smaller press stud strap). "Looooooove my new pacigag and the combinations i can make with the fronts"